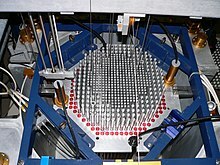 A nuclear reactor is a device to initiate and control a sustained nuclear chain reaction. Most commonly they are used for generating electricity and for the propulsion of ships. Usually heat from nuclear fission is passed to a working fluid (water or gas), which runs throughturbines that power either ship's propellers or generators. Some produce isotopes for medical and industrial use, and some are run only for research.